There is not a one-line definition for “What EXACTLY is neuropathy?” basically because there are so many different types of neuropathy. You need MUCH more information. In easier to understand terms, nerves are a lot like jumper cables. They carry signals between your brain and receptors (that are) located in your skin, muscles, and tissues. Just as you use a pair of jumper cables to recharge a weak or dead battery by carrying an electric charge (so you can start your car), nerves carry signals back and forth. In jumper cables, the copper cable acts just like a nerve in the body. The cable has two metal claws on each end (that you connect to the batteries). In the body, the claws are representative of the brain (on one end) and the receptors (in the skin/muscles/tissue) are on the opposite end. There are three parts to this chain in a jumper cable AS WELL AS in a neural pathway. There are MILLIONS of these chains throughout your body that connect everything to your brain. Depending on where in the chain you are having a problem determines which type of neuropathy you are likely suffering from. Diabetic neuropathy is different from chemo-induced neuropathy which is different from trauma-induced neuropathy, which is different from impingement neuropathy, and so on and so on. That is why you do not have to be diabetic to have neuropathy. You still have neuropathy…it’s just not a form of “diabetic neuropathy.” The symptoms of neuropathy also commonly vary. Please understand that PAIN is not always involved with neuropathy. Only certain types of neuropathy have pain. Other types have symptoms like burning or coldness, tingling, “stabbing or jolting” sensations, numbness, weakness, itching, etc. A lot of neuropathies have a combination of many symptoms. All neuropathies respond differently to medications, surgery, or treatments. That explains why two people who have neuropathy respond completely DIFFERENT to the same medications or treatment. THEY HAVE COMPLETELY DIFFERENT TYPES OF NEUROPATHY! It is ESSENTIAL for the Physician or Therapist to try narrowing down the exact TYPE of neuropathy you may have to determine the most appropriate medication or treatment for you (your specific type of neuropathy). 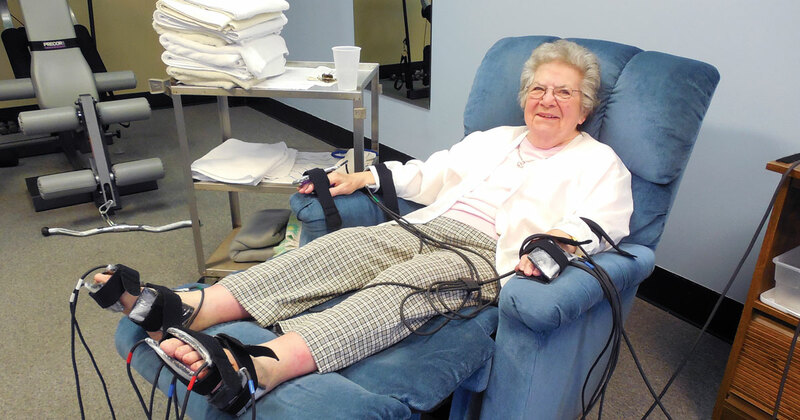 Testing and trying different medications are ways Clinicians’ use to try determining which type of neuropathy that you may have, which guides their medical intervention. If you’ve seen many different clinicians and still have symptoms, either no one has found the RIGHT treatment (you respond to) or you may have just given up on trying to find the right combination due to the time or money involved. At Complete Rehab, Brett Duffey is an Occupational Therapist, who specializes in the treatment of neuropathy and pain. He has treated over 2300 patients with neuropathy in the last eleven years. He has achieved a VERY high success rate in dramatically relieving or completely eliminating the aforementioned symptoms. Because he specializes in Neuropathy, he UNDERSTANDS neuropathy, the different types, and how the 3-part chain works. He stays current with all the latest medical breakthroughs and findings. Unless your Doctor specializes SPECIFICALLY in neuropathy, Brett is aware of some things they likely have not even heard of yet. Therefore – If you are having any abnormal symptoms in your arms, hands, legs, feet, or anywhere else on your body, you likely have some form of neuropathy…EVEN IF YOU HAVE NOT PREVIOUSLY BEEN DIAGNOSED BY YOUR DOCTOR! If you have seen multiple Doctors and feel like it has been a waste of time, you truly need to see Brett. His experience is unmatched, and his track record is PHENOMENAL! There are very few insurance companies that even require a referral from your doctor to see Brett. He accepts Medicare and is in nearly every other major Provider Network. If you call him, he can tell you what your plan requires and will even give you a free consultation on the phone or meet you in person at Complete Rehab to discuss your problems and determine if he can help you. Whether you’ve been diagnosed with neuropathy or not, Brett truly understands neuropathy, how it works, and how to treat it. After seeing Brett, you will likely join his rapidly growing list of satisfied customers, some who have come from as far as Georgia and West Virginia to receive his treatment. Feel free to visit his Website at www.CRTherapy.com to learn more or listen to some previous patients’ comments about his treatments. If you are just plain tired of suffering and need answers or help, you owe it to yourself to pick up the phone and give him a call today! He is in Clemmons at Complete Rehab, 6000 Meadowbrook Mall, Suite 22 (beside K-Mart) and his number is 336-778-0292.